At last week’s team presentations in Solvang, we sat down with Team CSC's big boss Bjarne Riis, and figured out how his quietly impassioned views will make some noise at the Tour of California and beyond. I’d bet if Bjarne Riis wasn’t so optimistic and chose the theater instead, he could play the part of his immortalized fictive countryman, Hamlet. He shares more than a passing resemblance in personal outlook with the brooding conscience of a man digging deeply inside himself, struggling with his soul to accept the power of integrity over mere savage opportunism. Heavy? His message may be heavy, but his delivery is all Teddy: Speaking softly while carrying a big stick—a stick called personal values - values he doesn’t take lightly. Believe it, Bjarne struggles with his riders’ souls - and they suffer for him gladly. Leading the troops: Bjarne Riis on full soft throttle. A quick read on him reveals more: handsome, muscular, clear and intense blue eyes, moving without importance, taller and bigger than on film—happier, too. He makes an impression on you quickly without a word—that’s his trademark—when choosing to speak he imparts his philosophies with care and a quiet passion. But make no mistake, the man can spin - and not just on a bike as the 1996 TdF champ - but spin a yarn, a tale of how his approach to cycling and the world at large works for him and how his values predominate any complex or gimmicky construct as the backbone of his team’s success. His story is without a doubt a success molded from personal and shared suffering, and strict attention to a larger sense of family values, all folding into his philosophy and tactics. His calculated methodology is distinct and perhaps superior to T-Mobile and Discovery Channel’s in its innovative approach to conditioning and training. He emphasizes such lofty concepts like one’s personal loyalty to strong values and ability to transcend suffering beyond the mere personal—it’s his version of ‘sharing the love’ from the trenches to the Tours. While other riders are snuggling up to their forbidden cheese cakes in December, his so-called Boot camps of bonding through suffering in the Danish hinterlands are now legendary—and so are the pay-offs in terms of victories-notably, when the going gets tough. So why do such stars like Ivan Basso, David Zabriskie, Bobby Julich, Giovanni Lombardi and Stuart O’Grady take the hard road with him rather than wolf down Twinkies in the off-season with another team for the same pay? Let’s be real here: Isn’t their nine months of suffering through boring diets and weakened immune systems from a lack of sufficient food, sleep and good weather in the prime of their life enough torture? 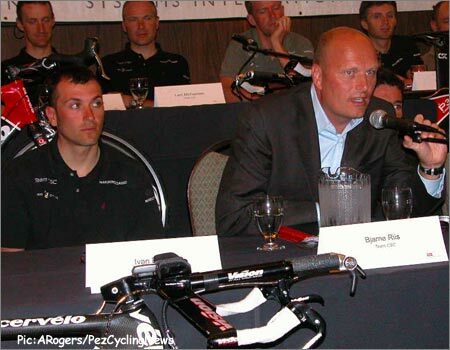 BS Christiansen, responsible for CSC training camps, confers with Brian Nygaard, team spokesperson, and Bjarne before the 2006 CSC team presentation. But since many of the Europeans already had to go through a few years of military service, maybe it’s a cake walk? Not really: the military wants you all to act the same, and take orders, where here it’s all about cohesive team work—and appreciating the differences no matter which language or culture they all start with. Bjarne doesn’t allow former buddies to bunk together constantly, so one night you’ll be with one rider who snores and speaks Russian and the next night you are with your pal from Italy, who snores and tells worse jokes than you. Rider to Bjarne: "I promise you once you try it, you won't want to ride anything else - but you've got to ride it more than once to appreciate and feel it's ride." Sounds familiar, Bjarne?! PEZ: With so many strong Americans on CSC riding the Tour of California, of course we’d love to see a North American on top of the platform every day, if, for no other reason than to bring cycling more exposure to the average Joe on this side of the cycling pond—so who should we be watching on CSC? Bjarne: I think we have more riders who can do the job better than most…but it’s a long time trial, and that can decide many things of course… Zabriskie is in good shape, Stuart O’Grady is very strong, and Bobby is not 100 percent but he’s ok. We have a strong team so I think we’ll have more cards to play with...let me be clear here: There are many good teams coming and it will be hard, but we came here to win the race. PEZ: Obviously, the way in which your training in dark December Denmark was very different than here in sunny Solvang. How do you keep the cohesion, what do you say that motivates the riders—do you conjure up some imagery or type of inspired reminder that harkens back to those bleak moments when they were tired and eating ‘Danish donuts’ (wood) in order to rally the team when it’s performing below par in a race? Bjarne: I say things like that when it’s necessary…it’s all about coaching… when you are there you analyze, go inside the team and feel them, I can feel them always and if I need a pep talk, positive or negative, that’s my job, to feel them and to… to… tell them, ‘ hey guys, we need more focus and concentration, come on!’ Or to be very relaxed-it all depends on the race… when we come to San Francisco, we will be focused 100 percent I know (locks his eyes with mine), so I don’t need to give a pep talk for this race. PEZ: You have the top ranked team in the world, yet you don’t have the circus-like hype or the melodramas of other teams surrounding your team - how do you stay under the radar of controversy and hype in this media-driven sport? Bjarne: We are not somebody else—we have what we have and we deal with what we have and we don’t need to deal with anything else… even when Tyler crashed, we didn’t have to change our ways of dealing with a problem. Bjarne: Yea, that’s fine that everybody likes us and focuses on us, but we just have to be ourselves. When we focus on that, the rest is easy… we don’t have to pretend to be somebody else…there’s a reason why we do what we do, yea [ - enigmatically, looking up, as if winking with his personal muse]. PEZ: There’s a lot of respect for you from other riders in the pro circuit, and just like in any sport, many athletes would rather take a pay in cut and be coached by a great leader like you. Do you appreciate where you are now in your career and if there was anything you could change, what would that be? PEZ: Will you be switching up on training techniques and locations in the future? PEZ: Your key word as a team is “innovation”, but even more, it seems innovation with emancipation - you are the leader with strict rules but you give them the leash. Chilling out in the hot weather never looked so easy: CSC, the world's #1 pro cycling team. PEZ: Is that why Ivan Basso decided not to switch when Lance asked him to hop on board the Blue Train? Bjarne: Well, first of all we had a contract. Everyone was talking about he was leaving but he would never skip out with a contract…impossible… but this is the reason why he is still here: That I believe—and also he believes - that he can develop the best way here than at any other team. PEZ: When you are looking for an Ivan or Bobby or a rough jewel, you seem to base their possibilities more on their value structures rather than how they are ranked. That’s refreshing, but incomprehensible! Here you have a stellar reputation yet you risk it on a rider who many considered as washed up just a few years back. Bobby Julich, I believe was 380th when you picked him up, weren’t you risking your reputation when you signed him? Bjarne: No! I don’t risk anything, a risk is something else, ya know: But look, it’s ok to risk if you CALCULATE a risk… if you always calculate… you can allow a certain risk, its like putting your money on the stock market. If you have this money secured and have some you can play with, then you can say, ok, this part of it I can risk because I can allow myself to lose that money, you understand? Come snow, sleet, rain, crashes or whatever: We're ready for the 2006 season. Bjarne: I know, but every single rider on the team needs me and needs the team, and needs to be taken care of…they’re all human beings, needing to be taken care of! I don’t care if you’re Ivan Basso, they ALL need coaching, and really, they all need…Family! And that’s what I am and what we are to each other, family. PEZ: How can you make it work with so many lifestyles without major frictions? Bjarne: It is not easy but it is about being aware of each other…how can I say this?… We all have to BE equal in this, but everyone is not equal because we have different mentalities, cultures and personalities and you have to allow them to be personal, ya know?—but that doesn’t mean that you can’t work within the same system with everybody, the same structures and values to move what I call our train. You can get off the train anytime you want and go, but if you want to stay and make it go faster? Stay on the train! And our riders want to jump on our train and go faster…that’s why I feel we’re ready to win the Tour of California…our train is very together-and fast! PEZ: No doubt about that. We wish you serious success at the Tour of California - and all year. Bjarne: Yes, we are very ready for anything…thanks.